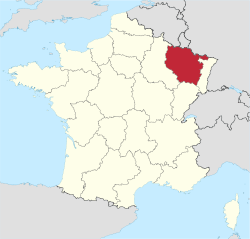 Lorraine (French pronunciation: ​[lɔʁɛn]; Lorrain: Louréne; Lorraine Franconian: Lottringe; German: Lothringen ; Luxembourgish: Loutrengen, Polish: Lotaryngia) is a cultural and historical region in north-eastern France, now located in the administrative region of Grand Est. Lorraine's name stems from the medieval kingdom of Lotharingia, which in turn was named for either Emperor Lothair I or King Lothair II. It became later the Duchy of Lorraine before it was annexed to France in 1766. 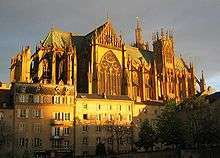 Saint-Etienne cathedral in Metz, capital of Lorraine. The vacuum in leadership, the French Revolution, and the political results and changes issuing from the many nationalistic wars that followed in the next 130 years, ultimately resulted in Lorraine becoming a permanent part of the modern Republic of France, albeit coming under German control several times because of later wars. While Lorrainian separatists do exist, their political power and influence is negligible, and Lorraine separatism is aimed more at preserving its cultural identity rather for genuine political independence. Lorraine in 1870: Colors show the original departments' territories. 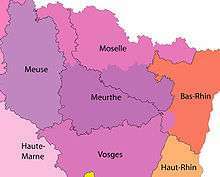 Most of Lorraine has a clear French identity with the exception the northeastern part of the region, today known as Moselle, which is historically German-speaking. In 1871, Bismarck annexed about a third of today's Lorraine to the newly formed German Empire following the Franco-Prussian War. This disputed third has a culture not easily classifiable as either French or German, since both Romance and Germanic dialects are spoken there. 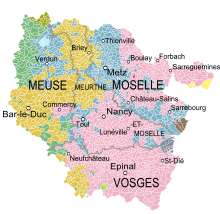 Like many border regions, Lorraine was a patchwork of ethnicities and dialects not mutually intelligible with either standard French or German (See Linguistic boundary of Moselle). ↑ cf. "Gesetz, betreffend die amtliche Geschäftssprache" (Law concerning the official transaction language) of 31 March 1872, Gesetzblatt für Elsaß-Lothringen (Legal gazette for Alsace-Lorraine), p. 159. 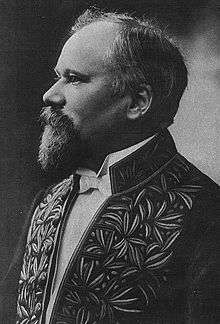 ↑ The imperial Statthalter was entitled to allow French as language of instruction in elementary and secondary schools in prevaillingly Francophone areas, cf. §4 of the "Gesetz, betreffend das Unterrichtswesen" (Law concerning the educational system) of 12 February 1873, Gesetzblatt für Elsaß-Lothringen, p. 37. ↑ The 'Law concerning the official transaction language' provided for exceptions from the German language in areas with Francophone majorities. ↑ Otto Pflanze, Bismarck: Der Reichskanzler [Bismarck and the development of Germany, Princeton, NJ: Princeton University Press, 1990; German], Munich: Beck, 2008, p. 484. ISBN 978 3 406 54823 9. ↑ Cf. § 26 of the "Gesetz über die Verfassung Elsaß-Lothringens" (Law on the Constitution of Alsace-Lorraine), retrieved on 24 April 2013. ↑ Such as replacing French pronunciation spellings of the local dialects to standard High German orthography, e.g. …bourg to …burg, …house to …hausen, …troff to …dorf, …ange to …ingen etc.